L to R: Judy Murphy Sechrist Augusta, Ga., Joyce Barinowski, Merriwether District, Edgefield County, Gina Bridgers, N. Augusta, Deanna Atkinson, N. Augusta, Wally Russ, Greenwood, SC and Anne Sawyer, Merriwether District, Edgefield County. The Birthday Girls started meeting 38 years ago during the middle 1970s after participating in the Christian Women’s Club in Augusta. They had their annual early Christmas party at the DoubleTree in Augusta on November 4. 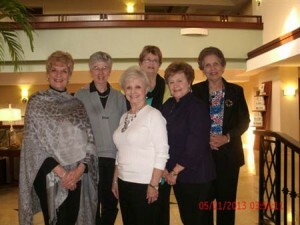 Four have been Chairman of the Christian Women’s Club: Judy Sechrist, Joyce Barinowski, Gina Bridgers and Wally Russ. Joyce Barinowski of the Merriwether District of Edgefield County speaks at Christian Women’s Clubs around the USA. She has also been involved in a Christian Heart Pin Ministry making pins with colorful stones to convey the gospel story. Recently, Christians in Russia and China have requested that she send thousands of pins and the tract, “Five Secrets from the Heart” that goes with the pin. It isn’t every day that someone gives their heart, is it?